First of all, you’re going to see Yaka Mein spelled with two words, like Wikipedia shows, and as one word, Yakamein. I don’t know if the spelling has officially “settled out” yet. No matter how it’s spelled, there’s no question that this is a soup/stew that’s like no other. It’s gonna be a little (or a lot) spicy and rich and you’ll see why it’s called “Old Sober” and said to have the restorative powers to cure a hangover! Believe me, it’s just as good if you have no hangover! Although Instant Pot Yaka Mein can be made from all kinds of things from chicken to pork to turtle (yep) Yaka Mein as it’s been popularized recently is usually made with beef. Sometimes leftover beef, but generally a tough, flavorful beef that’s going to stew for hours. You can see why I wanted to develop an Instant Pot recipe! But no worries, I have you covered if you don’t have an Instant Pot and gave Stovetop instructions, too. The broth might be enhanced with onion, beef base, Worcestershire, or seasoning salt but it is almost always made with a teaspoon or two of Creole seasoning and a splash of Soy sauce. Once the softly simmered beef (or the quicker Instant Pot beef) reaches a shreddable state, it’s served over spaghetti noodles, topped off with the broth and garnished with a hard-boiled egg and green onion. Sound a little bit like Ramen or Pho? Only a New Orleans version? Umhmm. Making Instant Pot Yaka Mein will shave hours off the cooking time of the traditional stovetop version and in the Instant Pot, the noodles cook right in the broth. In most of the recipes I’ve seen on the stovetop, the noodles are cooked separately. I recommend going that route if you’re simmering your Yaka Mein on the stove. I’d also cook the noodles on their own if you think you’ll have a lot of Yaka Mein leftover so the noodles and broth can be stored separately. The meat can be any tough and flavorful cut. Brisket is used and so is Chuck. I just happened to have Boneless Beef Ribs from Aldi that I pulled out of the freezer – honestly, I thought it was a Chuck Roast. Also, anything this brothy with the amounts of meat shown in the recipes I saw is gonna need a little help. I don’t think there’s any shame in your game if you use a little beef base or start out with broth. I started with one tablespoon of base and then upped the amount to two tablespoons. Note that there is no browning or sauteeing in this recipe and there wasn’t in most of the recipes I looked at. Just simple home cooking. When cooking spaghetti in the Instant Pot, break in 1/2 and add in small bunches at right angles. Most of the recipes I looked at made a huge pot of Yaka Mein, while mine is a smaller amount – about six servings. Without thinking I used the same amount of Creole seasoning as the larger recipes, 2 teaspoons. Surprise! My Yaka Mein was hardly spicy, and that was before adding in the noodles. I am not serving children or anyone wary of heat so I upped it to 2 tablespoons for just a little catch in the back of the throat. (Keep in mind that different brands of Creole seasoning can vary in heat level.) I also added my own Seasoning Salt but held off on any other salt because I was using the beef base, Soy sauce and seasoning salt already. In the end, I added a good teaspoon of salt and the Yaka Mein really needed it. That’s a lot of salt, I know, but that is partly because the noodles are cooked right in the Instant Pot so the broth has to be pretty flavorful. If you’re making your Yaka Mein on the stove and cooking your noodles separately, you probably won’t need as much salt, and maybe won’t need as much Creole seasoning. Err on the side of less coz you can always add more. Do make sure the water you’re cooking your noodles in is seasoned well. I’ve always been told that many Cajun and Creole dishes aren’t spicy, that that is what hot sauce is for. And Yaka Mein has a history of not only being a hangover cure but being cooked for the family. So pick your heat level and pass the hot sauce, ketchup, Worcestershire and/or Soy! And enjoy! Slurping is to be expected. Add all soup ingredients to Instant Pot. Seal and set to High Pressure, 35 minutes. Quick release the pressure when finished. Soup will look watery. Working quickly, remove the meat, skim the soup of fat if desired and add the noodles. When placing the noodles in the instant pot, place a bunch of the noodles (about 1/2 inch diameter) in one direction, then repeat, placing the next bunch of noodles at right angles to the first, alternating until all noodles are in the pot. Make sure noodles are submerged. Seal and set to High Pressure, 9 minutes. Immediately release pressure when finished. The soup may appear watery initially but the noodles will absorb a bit more of the liquid. While the noodles are cooking, shred the meat. Serve by scooping noodles into a bowl, then a portion of the meat and top with broth. Serve with hard boiled egg halves and desired garnishes. Note: If soup does not have enough broth, add more water or water and beef base. Add all soup ingredients except salt to large Dutch oven. Water should cover meat by about an inch. Bring to a boil, partially cover, then turn down to a simmer and cook until meat is tender and shreddable, 2 1/2 to 3 hours. Check the water level from time to time and add more to keep the beef covered by about an inch of water. Shred the beef and return to the soup. Taste and adjust seasonings, skim excess fat from the top of the soup. In the meantime, while the soup is cooking, prepare spaghetti and hard-boiled eggs. Serve by adding a portion of the spaghetti to a bowl, top with a portion of the beef and broth. Add hard-boiled egg halves and desired garnishes. Red Beans & Eric and Dog Street Comics. And of course, Miss Linda from New Orleans Style Soul Food. The most comprehensive article I found was in, surprise: The BBC Travel. 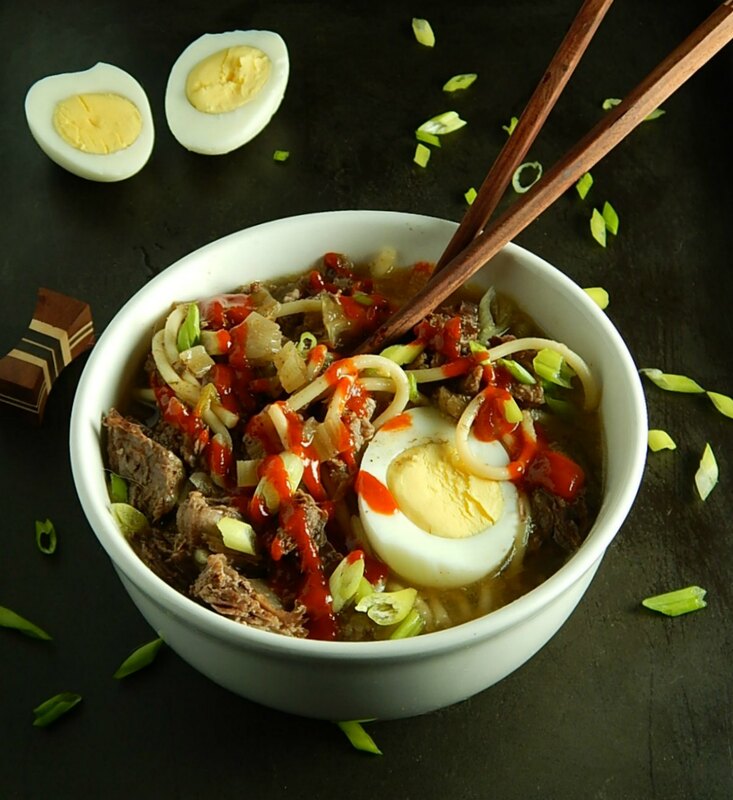 I’ll be sharing my Instant Pot Yaka Mein this week at Fiesta Friday 235, hosted this week by Mara @ Put on Your Cake Pants and Hilda @ Along the Grapevine. Don’t you just love both of those blog names? Click over and take a peek – I think you’ll love both of their sites as well. Mara has a gorgeous blog featuring more than just cake (although I think she excels at dessert) and Hilda’s blog is full of wonderful, natural recipes and sustainable hints. You’ll never look at a weed, plant or flower in the same way, again! This entry was posted in Click here for Bargain Meals, Click here for Fabulous Food Posts and tagged Beef, Beef Ribs, Bell Peppers, brisket, Cajun & Creole, Chuck Roast, Green Onion, Instant Pot, Pasta, Soup, Southern Cooking, spaghetti. Bookmark the permalink. Hi Tweety! Thanks so much. I’m glad you liked it. It’s kind of like Beef Noodle Soup, but better, I think! Looks yum, and sounds simply wonderful. I am glad you included stovetop directions as well – one day I plan on an Instant Pot, but there are other expenses that are coming first. (Like getting my pantry shelves installed so I can store the item!!!) Bookmarking. I remember you went through a lot this past year, too. With the power going out during you r move and all. Oy veh! Wow, this looks like one seriously satisfying dish – full of flavor and lots of protein! Your photos are making my mouth water. And that’s really helpful that you included both instant pot and stovetop directions! Thanks for bringing this to Fiesta Friday! My pleasure!! Thanks for hosting for us! I’ve never even heard of Yaka Mein before! How is that possible?! And I thought I knew everything about New Orleans, which only goes to show I know nothing at all. It sounds so wonderfully comforting, Mollie. It’s been added to my To Try list! I know, right?! I love New Orleans, too! Just goes to show that there is always more where ever you are! That’s one thing about being a food blogger – I am always running across new things and trying new recipes and it’s just fun, isn’t it! There’s just never enough time! This is the kind of recipe I love to make, but never have tried it in an IP before. Your instructions for removing the meat and then cooking the noodles make sense – I’ll give it a try. Still trying to get used to the pot, maybe this will do the trick. The IP certainly takes a leap of faith! Putting everything in there and not really being able to check it or taste it. That was the hardest part for me. Also I came across a lot of recipes that used questionable timing. Just keep in mind that about 1/2 the cooking time for most things is about right. This looks so delicious & yum! Lovely comfort food. I’m looking forward to cooler weather, bit tired of salads! Oh my gosh, we dipped down in the 50’s last night! But I have a feeling the rest of August is going to be brutal. I have a small kitchen, too. So I converted a nearby coat closet for my appliances! And my IP is almost always in use and on the counter so when I need more counter space you’re likely to see my IP on the buffet in the living room or the dining room table, lol! It just migrates around. We got down to 56 degrees yesterday (weird) so it seemed a perfect time to make Yaka Mein. It’s easy and fun to eat. Thakns Ronit, and so different than anything I’ve had.